Server App-V is one of those things that you know is coming but you might not be sure exactly what to think of it. This article helps! Taking a quick approach, Server App-V is a technology that enables the virtualization of server applications, removing the dependency of a server application in a specific Windows Server instance (whether that instance is running in a virtual machine on directly on hardware). Server App-V works with a Virtual Environment, but this interacts with the operating system and vice-versa. For example: Virtual services are visible to the OS. This is particularly important since we can use monitoring tools, such as System Center Operations Manager, to monitor the functionality of our virtual server application. In the sequencing process of an application, Server App-V also detects and includes in the package, several additional components that Desktop App-V does not. The Local Users and Groups that the application might create, IIS applications, COM+ and DCOM components, WMI providers, performance counters and all other components Desktop App-V detects and includes within the package. Server App-V appears as a “Private Cloud” concept in the way to offer “Software as a Service” (SaaS) and/or “Platform as a Service” (PaaS). This is the ability to deploy software or a platform without requiring installing it. Even though we usually use the concept of “application” in the same way as “software”, the term “SaaS” in Server App-V does not represent the entire scope of the platform. Server App-V includes the possibility to provide “as a Service” platforms like database engines or in the near future Exchange or SharePoint. One of the main goals of Server App-V is to have a predictable and repeatable way to deploy server applications. Some of the common problems we usually find in organizations are that moving platforms from testing or pre-production to production is never an easy ride – often several inconsistencies might be found. Server App-V includes the possibility to separate the configuration of the server application, in order to accomplish scalability in the deployment process. 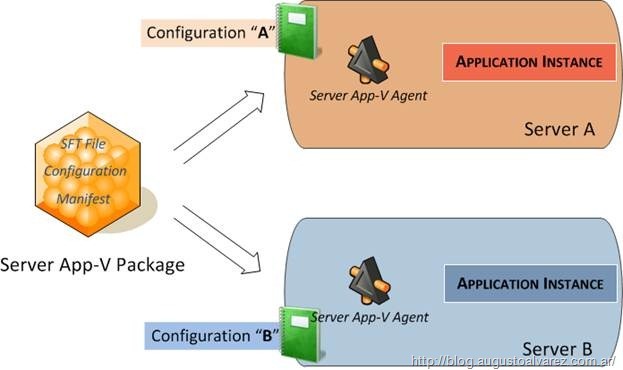 This way, we can have the server application package with the configuration “A” deployed in one server and the server application package with the configuration “B” deployed in another server. Server App-V also handles state management operations. This is accomplishing by backing up the current state of an application and restoring it in a separate instance of the application. There’s no more streaming processes in Server App-V. Client agents still exist but the interaction with the Server App-V packages can include using just PowerShell Cmdlets or using System Center Virtual Machine Manager 2012. Windows Azure represents Microsoft’s “Public Cloud”, from which we can use a remote platform to handle software (SaaS), services/platforms (PaaS) and infrastructure (IaaS). At the moment, Windows Azure is available only to selected clients by a closed beta. Server App-V is not compatible just yet with the worker roles in Windows Azure, but it will be in the near future. Ok that’s good. i knows very well about server. according to me benefits of server are..Lower number of physical servers – you can reduce hardware maintenance costs because of a lower number of physical servers..By implementing a server consolidation strategy, you can increase the space utilization efficiency in your data center..By having each application within its own “virtual server” you can prevent one application from impacting another application when upgrades or changes are made..You can develop a standard virtual server build that can be easily duplicated which will speed up server deployment.You can deploy multiple operating system technologies on a single hardware platform means Windows Server 2003, Linux, Windows 2000, etc..